10 Worlds Most Bizarre Creatures - What on Earth? Check out our top 10 most bizarre creatures from around the world. Forget cats, dogs, lions and bears, mother nature must have really indulged in her creative side when it came to these weird and wonderful beasties! Wouldn’t it be great if you could detoxify the air around you, removing pollution and poisons? 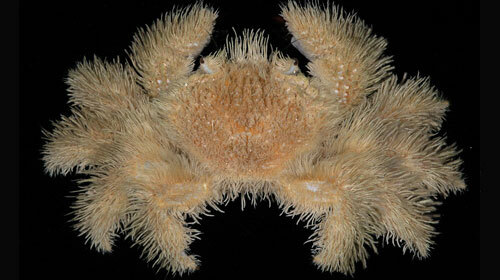 That’s exactly what the ‘hairs’ that this crab is named for do. The ‘hair’ which is actually setae acts as i filter and removes damaging poisons and chemicals from the water surrounding the Hairy Crab. This ability is especially important to the blind Hairy Crab as it is known to make its home in some of the most inhospitable environments. The Olm is a fascinating example of an amphibian that makes its home in the waters of Europe. This bizarre creature can only be found in the deepest, darkest waters and relies on none of the traditional senses we humans are used to such as sight or hearing. The Olm feeds on small invertebrates and it receptive to chemical and electrical signals which it uses to find and identify prey. 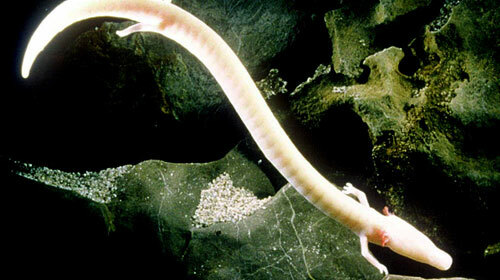 The Olm is sometimes known as the ‘human fish’ because of its coloration and was sometimes referred to as a ‘baby dragon’ in years past. Is it a spider? Or is it a giraffe? Look at its neck! The Assassin Spider (above) is indeed a truly bizarre specimen. 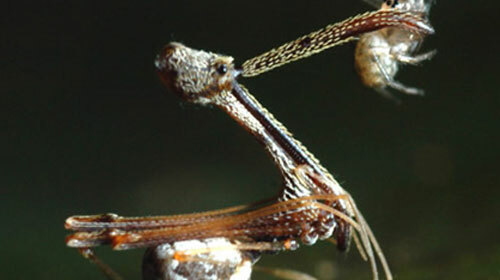 The Assassin Spider sports a long neck which is needed to provide leverage due to its massive jaws which is uses to expertly catch and assassinate its prey. 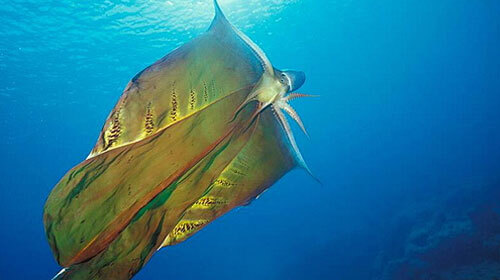 The Blanket Octopus is a truly remarkable sight. This unique octopus is able to open its tentacles to reveal a thin colorful membrane which spreads out like a ‘blanket’, this is done to make the Blanket Octopus look bigger and ward away predators. 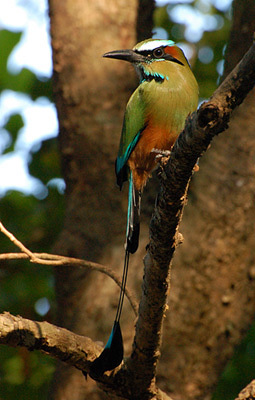 The being said, only the female of the species has this ability compared to the male which is tiny ( max 3cm). 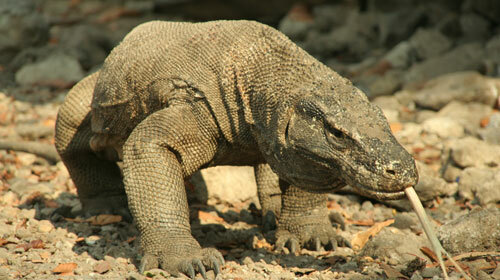 The female of the species is certainly the more spectacular and can grow up to 2 meters in length. The Leafy Sea Dragon is a master of camouflage and spends its days drifting through the water perfectly emulating a floating piece of seaweed. The Leafy Sea Dragon gos to great lengths to stay camouflaged such as traveling extremely slow as to not give itself away. Like its closest relatives the sea horses, the male Leafy Sea Dragon carries fertilized eggs until they are ready to hatch. Although the enigmatic Blobfish is rarely seen above water alive its still one of our favorite creatures and definitely a prime candidate for the worlds most bizarre creatures. The Blobfish doesn’t really do much… content to float in place and wait for food to stumble upon it, the Blobfish is a true opportunist. This type of lifestyle works well for the Blobfish as it means the Blobfish is able to survive on small amounts of food due to the lack of exertion in its life. 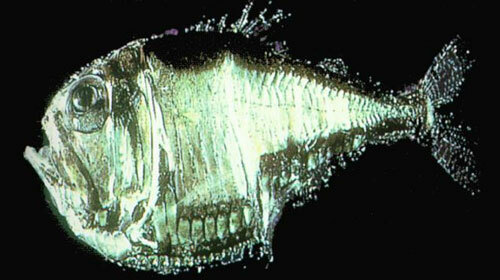 This small fish spends its entire life in the darkest parts of the worlds oceans hidden from prying eyes. The Hatchetfish may not seem spectacular at first sight however the Hatchetfish is actually a light source in the deep, dark oceans it calls home. The Hatchetfish has organs in its sides called photophores which can be ‘turned on’ to give out a glow similar to that of an led light. The Hatchetfish uses this ability to attract unsuspecting prey and will do the opposite to evade predators. I know the picture looks like a snake but i assure you this is 100% a caterpillar. Infact that is the entire point of the Hemeroplanes Caterpillar, this master of camouflage has a very uniwue defense mechanism in that it can do a very good impression of a pit viper. If the Hemeroplanes Caterpillar feels threatened it will raise the top half of its body from the surface and inflate to resemble a pit viper – this crafty caterpillar even emulates a lunging motion giving the impression its about to strike! 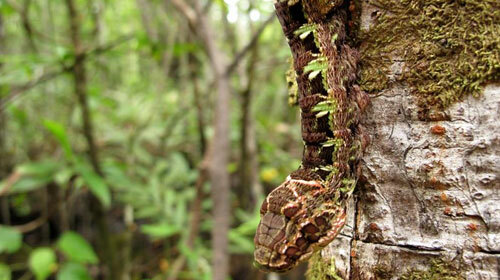 So far we’ve had numerous masters of camouflage in this list but the Satanic Leaf-tailed Gecko really deserves the number one spot for being bizarre – just look at it! Could there ever be a more accurate representation of a crusty dead leaf? I don’t think so. 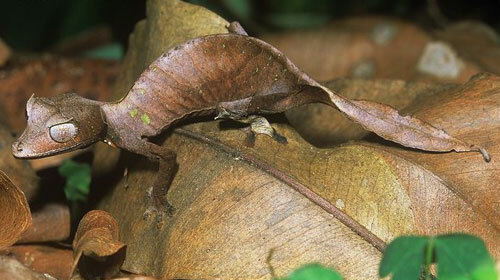 Like so many wonderful and bizarre creatures the Satanic Leaf-tailed Gecko is a product of Madagascar and can not be found anywhere else… you probably wouldn’t notice it anyway! So there we have it, our top 10 worlds most bizarre animals! granted it seems most of the worlds bizarre creatures reside in the worlds oceans. 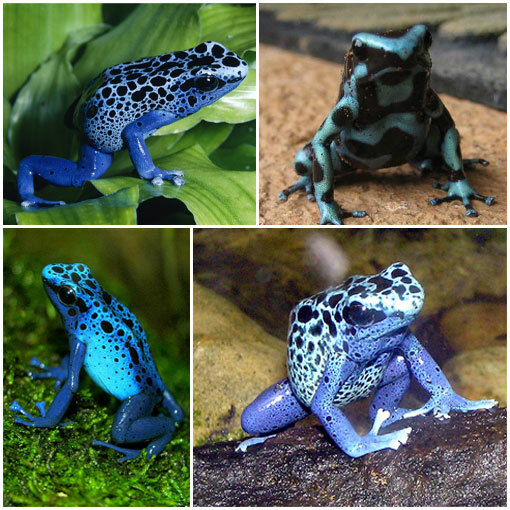 Let us know if you’re lucky enough to have a first hand experience with any of these masterpieces of nature! Yay!! It got Olms! I love Olms! I saw an Olm!! At a center though. It so cool they can live without food for ten years!! I went deepsea fishing off the coast of Wellington New Zealand and had several odd creature encounters. It was awesome! That blanket octupuss is so amazing I wanna se one in person! WOW!!!! Those are some STRANGE creatures. 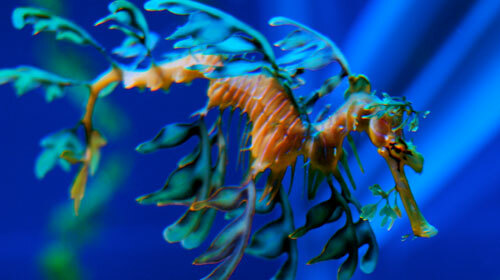 ya know, i actually thought that the sea dragon and blanket octopus were pretty cute!!! oMg. They all look soooooo gross!!!! lOl. 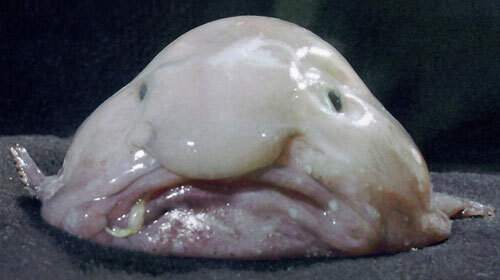 Especially that human they call a blob fish!! love the photos, but you really could use an editor or proofreader.